How the Gaylord shop in Lynwood California turned a badly damaged 1954 Buick Riviera into a Dream Custom Masterpiece for owner Sal Mammano. Towards the mid 1950’s several of the major Custom Car builders in California created heavily restyled, almost concept car like custom creations. Cars that took Custom Restyling to a new level. 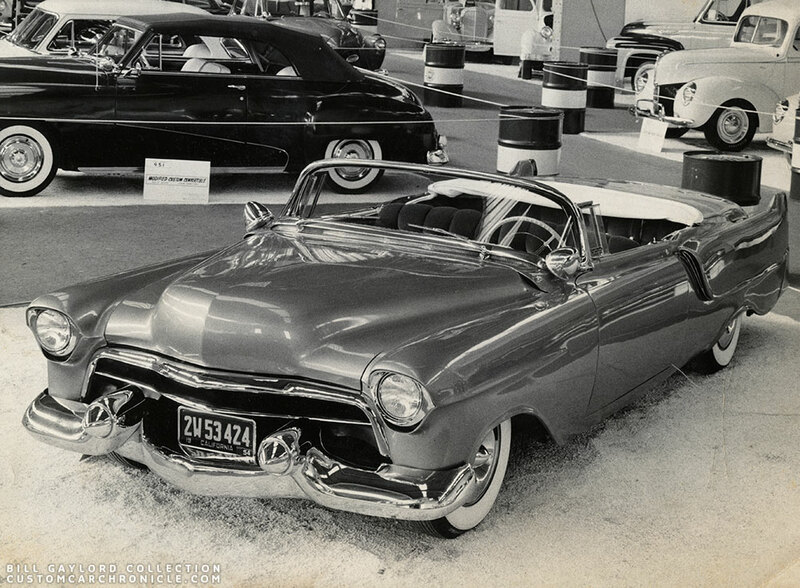 The Barris Shop was working on the “Golden Sahara” based on an 1953 Lincoln Capri for Jim Skonzakes from Ohio, as well as a sectioned 1954 Cadillac “The Parisienne” for Milton Melton, and Bill Gaylord was creating a full concept show car based on a ’54 Buick. These Custom Cars were created for clients that were able to spend the money needed to creating these new types of customs. Some of these new clients planned to use these Custom Cars to help promote their successful business’s, or plan to extensively promote these cars at car show all over the country. It appears this new clientele generated a new style of Custom Car, more classic or coachbuild that what had been done in the years before. 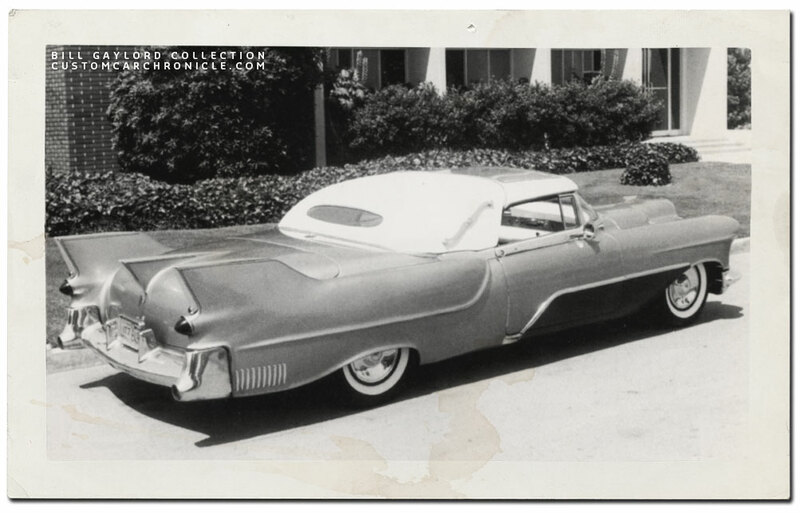 In 1954 Sal Mammano delivered 1954 Buick Riviera to Bill Gaylord‘s shop in Lynwood California. Although Gaylord never really advertised with it, his shop could tackle a whole lot more than just the interiors and tops they were best known for. 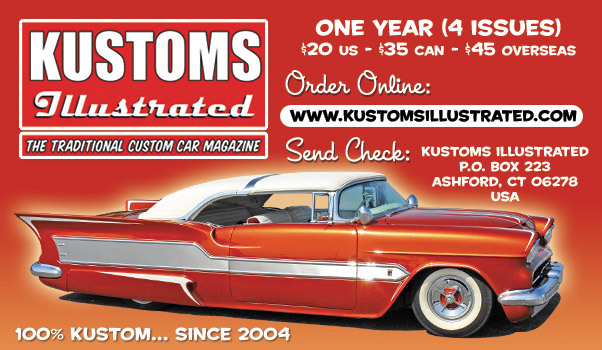 This 1954 Buick is the perfect case to show this shop did not hesitate to take on the nearly impossible jobs. You see, the ’54 Buick Sal delivered to the shop was, despite having only 3500 miles on the odometer, in far from pristine condition. The car had been in a rather bad accident damaging the car pretty bad. So before the team at Gaylord’s could start the restyling process the car first had to be pulled straight and fixed. Sal Mammano ran a very successful hair styling salon “Casa Di Bella” in Downey Ca. and he planned to help promote his salon with a beautifully restyled Custom. 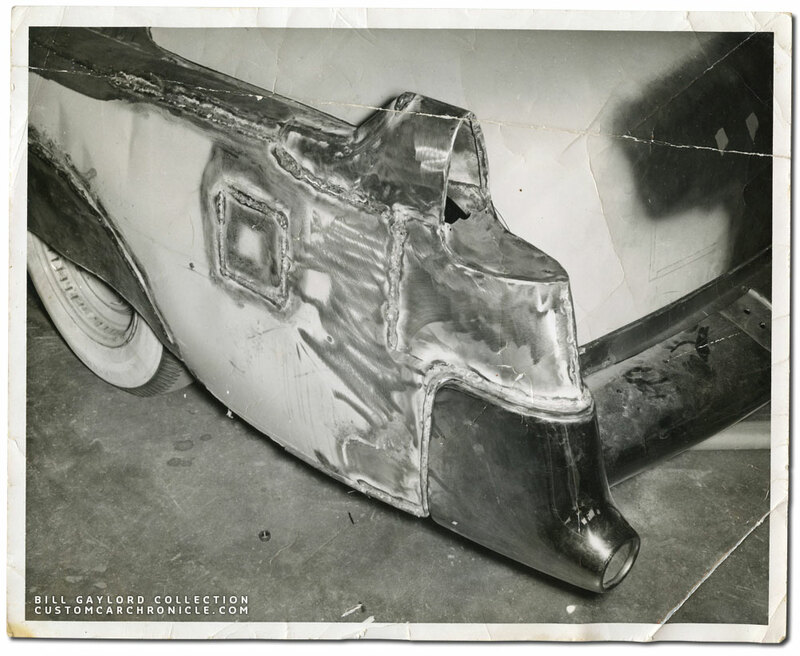 Before the body was straightened Gaylord had collected a ’54 Cadillac front end and rear bumper and taillights, and had marked the car for the modifications he had in mind for it. 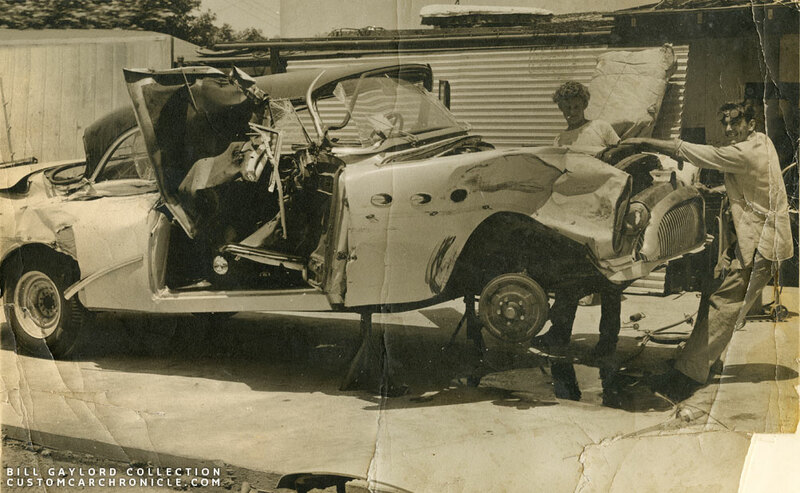 The damaged Buick parts that would not make part of the final design, were simply removed or cut off before the car was straightened. With everything in line, the body could be sectioned 3.5 inches to create a much longer looking car. The Cadillac front fenders were matted to sections of the Buick, and the hooded headlights were extended 2 inches. The Cadillac hood was modified at the front to match the new grille opening which was created from the Cadillac grille surround. A custom scoop was created near the back of the hood on each side. 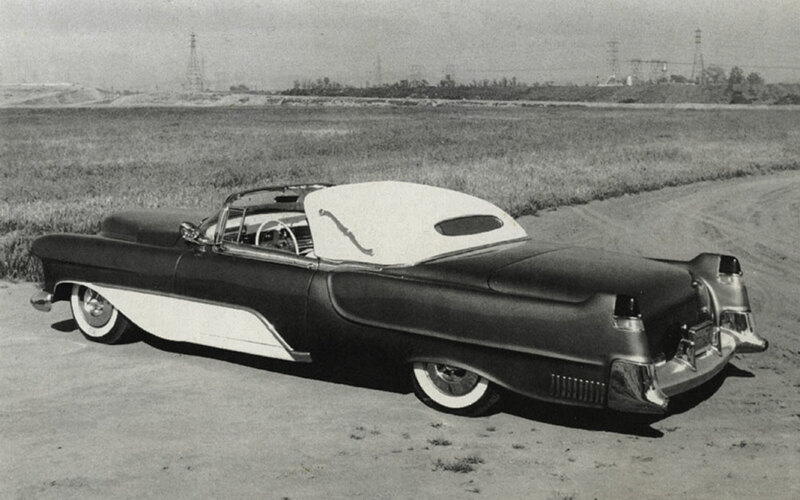 The rear fenders were extended, and heavily reshaped to accepts a set of 1954 Cadillac taillights and the narrowed 1954 Cadillac rear bumper. 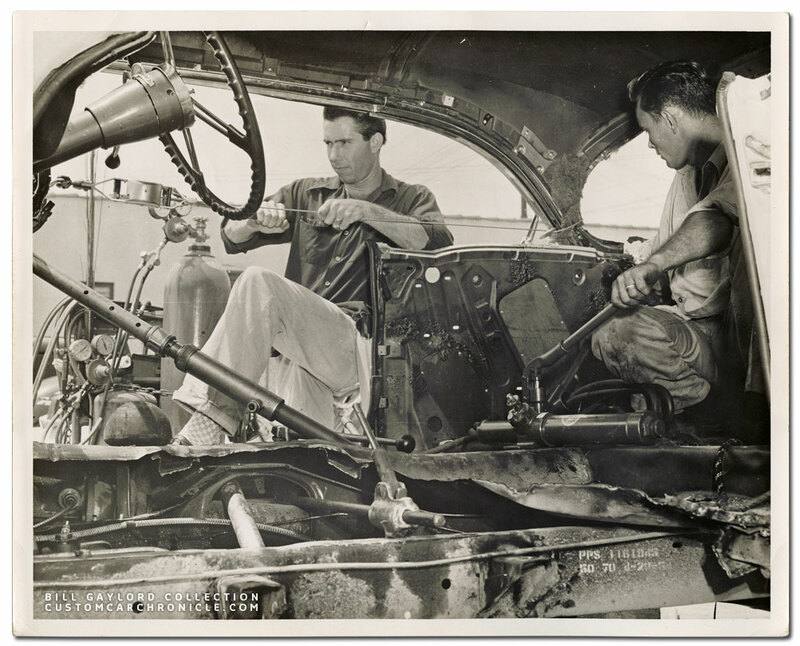 This is how Sal Mammano delivered the Buick to Bill Gaylord’s shop… it needed a little work. 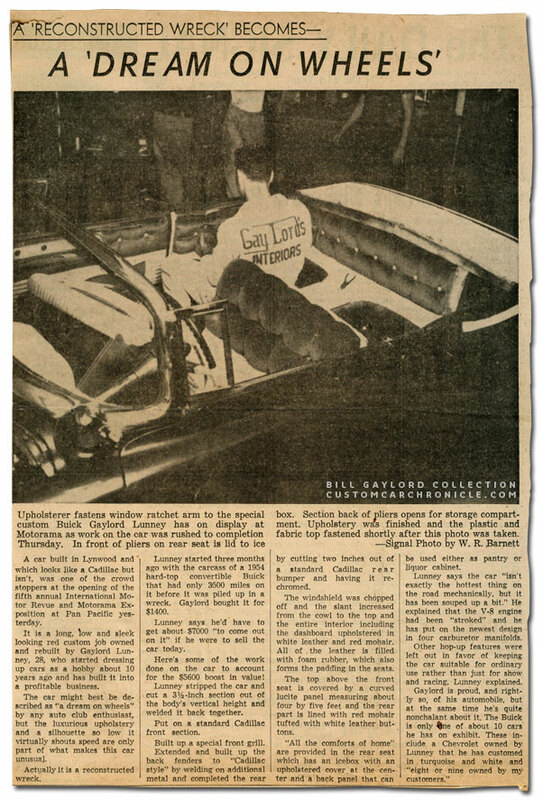 Bill Gaylord (outside of the car) and an employee working hard to get the body back in shape.Notice that large portions of the floor have been cut away. 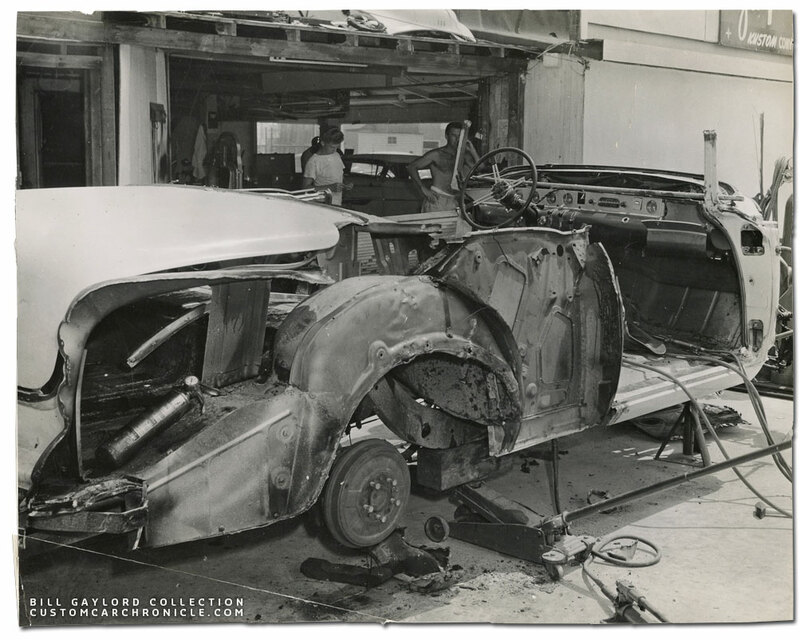 When the frame and body had been straightened they started to remove the parts they would be replaced by the Cadillac components, or in need of more body work. Many shops would not have taken on a job as complexed as this one. Both the wheel openings front and rear were completely reshaped with a very elegant teardrop shape fine tuned with a wonderful lipped edge. The peak running from the headlight covers to the sides of the front fenders was repeated on the rear fender, but much longer and towards the rear of the door this shape curved up, all the way to the belt-line and formed a scoop to help cool the rear brakes. The new grille opening was filled with a shaped and chrome plated pressed steel insert. The front Cadillac front bumper was narrowed to fit the Buick body. This interesting construction photo shows how the original round Buick rear wheel openings had been filled in prior the new reshaped wheel opening. It also shows that the rear fender is created from the Buick fender to with the Cadillac taillight was added using sheet metal and round rod. The hard top had been completely removed and the windshield surround was cut free from the body and angled back to give the car a chopped appearance. The stainless had to be cut and reshaped to fit this new set-up. A two part “Sedanca, or Coupe de ville” style top was created for the car. Bill Gaylord created the base for the new type from wood covered with fiberglass, which was still a very new product to be used back in 1954. Once the fiberglass had been shaped it was covered with thin padding and white Orlon and the sides were decorated with chrome plated cast bronze landau irons. The front, removable, section of the roof had a large clear lucite center section. With all the body work done the car was painted red. The interior was done really beautiful in white leather tuck & roll with button tufted red velvet. The car was dressed up with a set of Appleton Spotlights, and 1953 Cadillac hubcaps. The car was actually finished on the show floor of the 1954 Pan Pacific Petersen Autorama show. 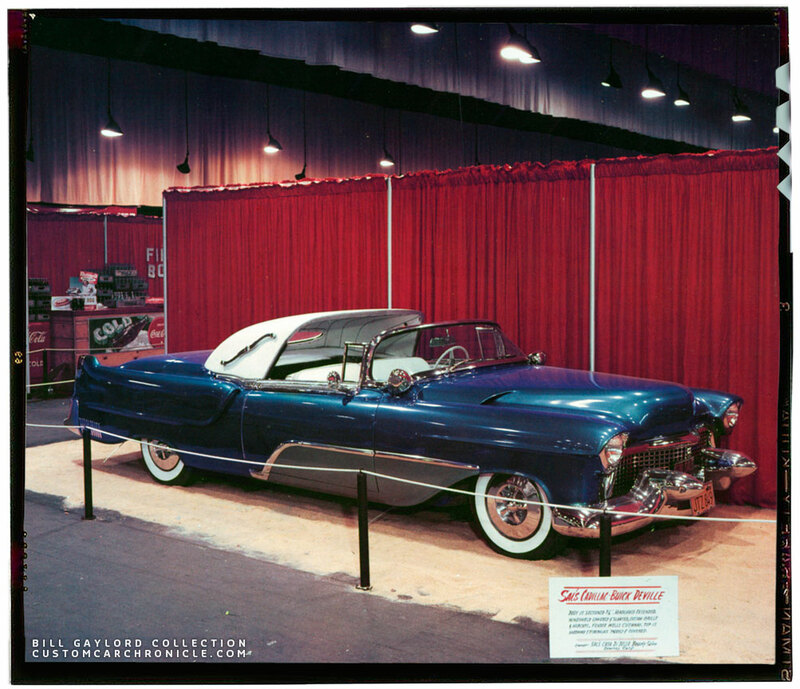 This is the only photo that we have been able to find that shows Sal’s Buick in its first red finish at the 1954 Petersen Motorama show in November 1954. At the shows Bill sometimes lifted the top on his cars to give the audience a better look at the beautiful interiors he did. 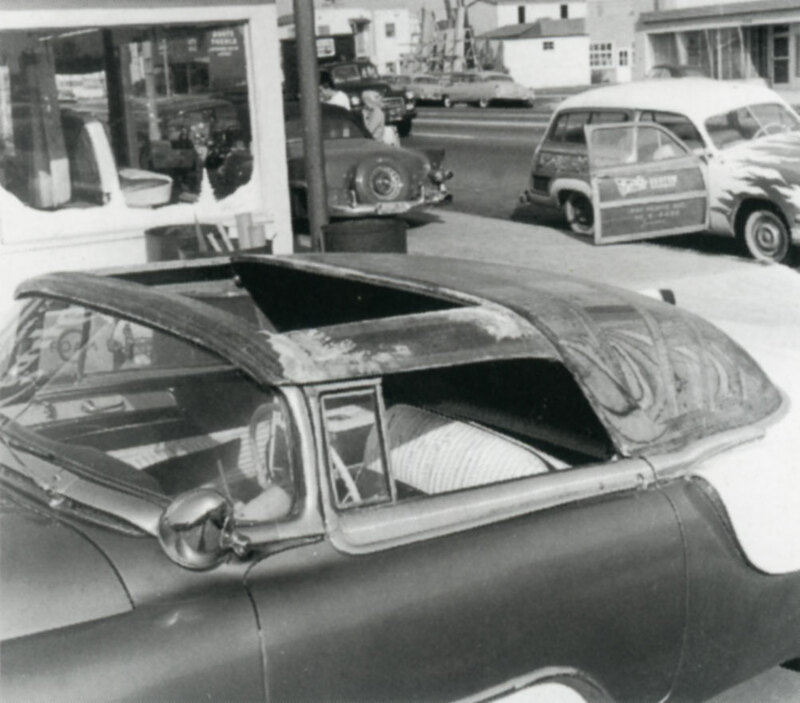 Sal’s ’54 Buick in 1954 shows the car without the two part Coupe De ville top. This photo also shows very good that the first version of the car did not have any side trim added. Not on above the belt-line, nor on the body sides. Not too long after the car was finished, the Buick was redone again. We are not 100% sure, but the car was most likely taken to the Barris shop at this point for an new paint-job and some new details. It might also be possible that Barris only did some minor work on the car, details and info on this are a bit sketchy. For this version the 1954 Cadillac front bumper was replaced with a 1955 Cadillac unit that had longer and smoother bullets. A set of 1955 Cadillac Eldorado belt line trim pieces was modified to fir the Buick, and a side trim created from 1955 DeSoto units was created to be able to do a great looking two-tone paint-job. The car was then repainted with 30 coats of opalescent blue lacquer and white below the DeSoto side trim. The 1953 Cadillac hubcaps were updated with Eastern Auto spinners added to them. The interior was redone in white and dark blue. At one point the section below the DeSoto side trim was painted in a light metallic blue. But it is unknown if this was done before or after the white version. 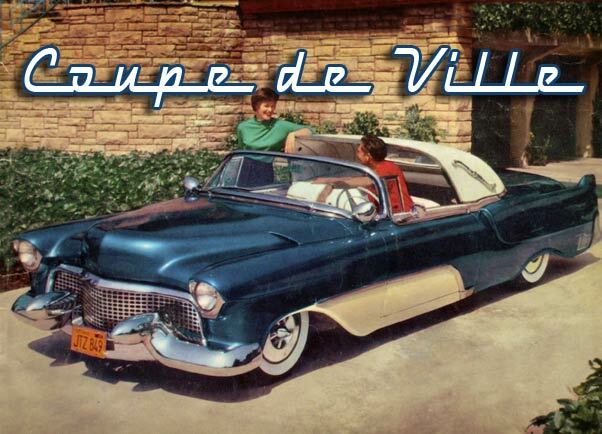 The Blue and white version of the is how the Coupe de Ville appeared in color on the September 1956 issue of Motor Life magazine. Two a new side trim was added that allowed for a nice two tone paint job. with the addition of De Soto side trim, and painted with thirty coats of opalescent blue lacquer, with light blue below the trim. A new interior in white and blue replaced the red velvet. Later, the lower panel was painted white. This version was featured prominently on the cover of Motor Life magazine in September of 1956. This color photo shows the Buick with the new Blue paint-job and the lighter shade of metallic blue below the side trim. The car looks absolutely stunning and very classic. Notice the new longer and smoother front dagmars. The sand below the car and the red curtains behind it make the absolute perfect setting at this 1956 show. 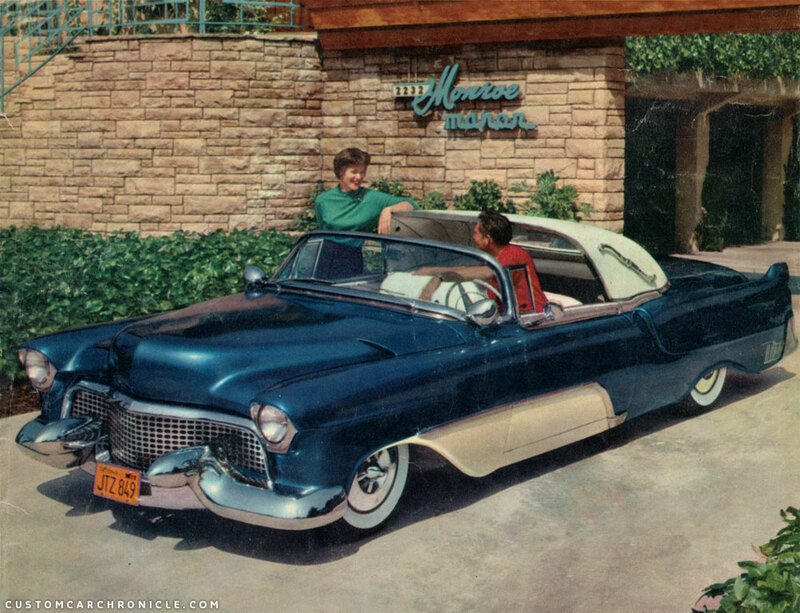 The beautiful color photo used for the Motor Life September 1956 magazine cover was taken by Bob D’Olivo with magazine art director arch Grey in the car at 2232 North Beachwood Canyon Drive in Hollywood. This rear 3/4 view shows how long the sectioned Buick with Cadillac components looks. The chrome plated louvers added to the rear fenders are also new for this version of the car. The September 1956 issue of Motor Life magazine showed the car in color on the cover and in black and white on a full spread inside. 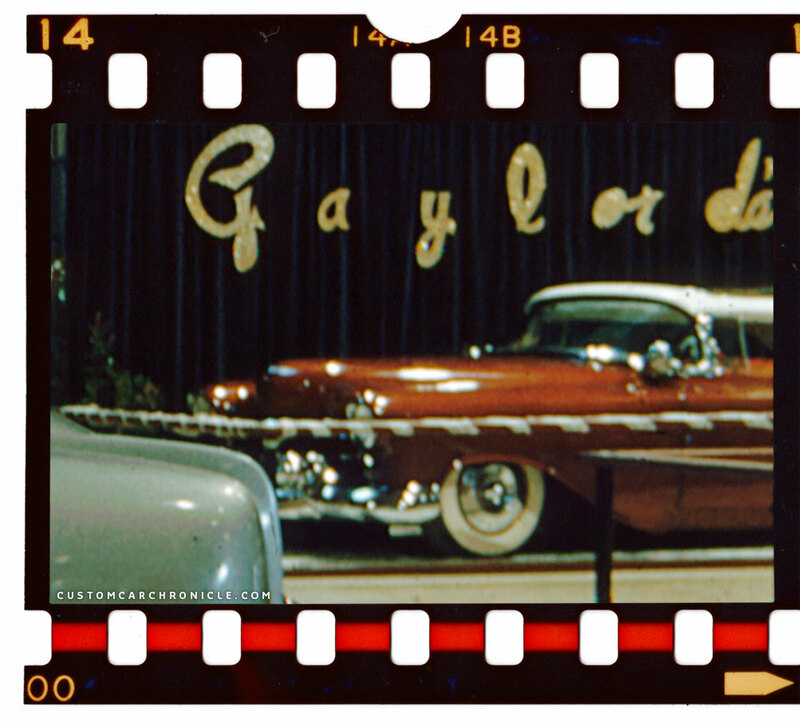 The George Barris photographed and written article mentioned Gaylord as the builder with details done by Barris. 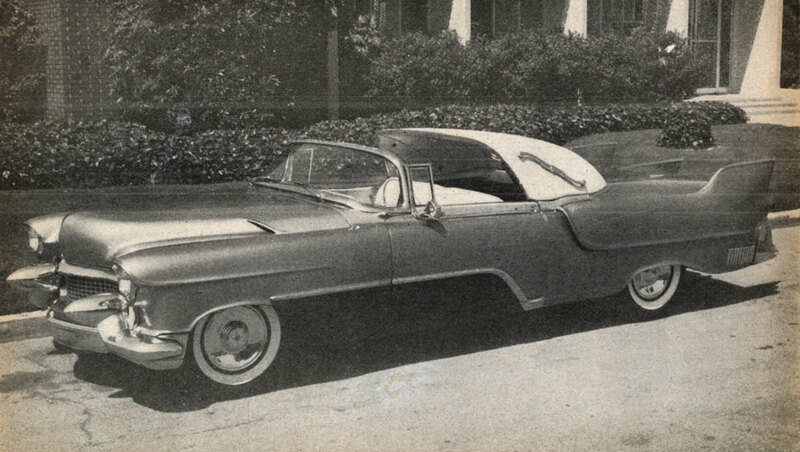 The car was selected as one of the 10 of the best customs in the 1957 Custom Cars Annual. 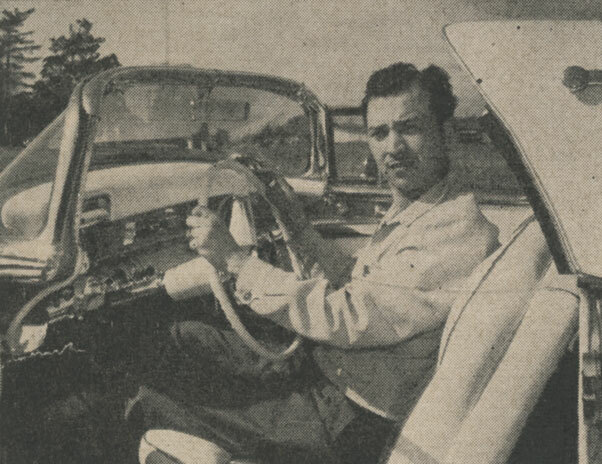 One of the photos used in that annual was this one with Sal Mammano behind the wheel of his Buick. At one point, it is also not known when, the car in this version was repainted again and the whole rear of the car above the added lip and the trunk was repainted in white. This photo taken at the Gaylord shop, shows how the wood and fiberglass top was re-upholsterd. This photo shows very clearly how the transparent center was installed in the front removable section of the top. The car has the second white and dark blue interior. Notice the upholstered seat in the shop window in the background. Some time later the car was redone again. This time with some more body work. The 1954 Cadillac taillights were removed from the rear fenders and replaced with Cadillac El Dorado rear fender fins. 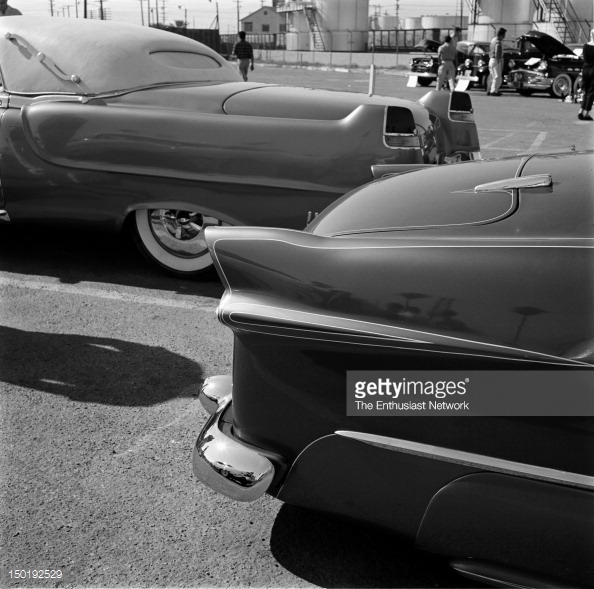 A set of modified ’56 Oldsmobile taillights was added into reshaped pods below the Caddy fins. A third El Dorado fin was added to the trunk and the whole body was re-painted in Brilliant Gold and dark metallic blue below the side trim. The 1953 Cadillac hubcaps were replaced with 1957 Lincoln units. The last version of the Buick as we know it has three Cadillac El Dorado fins added and the car is now painted polychromatic gold and metallic blue. Later the Buick Coupe de Ville was sold to Tony Carlos. And we have not been able to find out what happened to the car after that. The one photo shown above is the last we have been able to find. 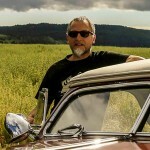 If anybody reading this knows what happened to Sal’s Buick after 1957, please email Rik here at the Custom Car Chronicle. We would love to find out and add this part of the story to this article. Two images showing Sal’s Casa Di Bella Beauty Salon where the original owner Sal Mammano worked. 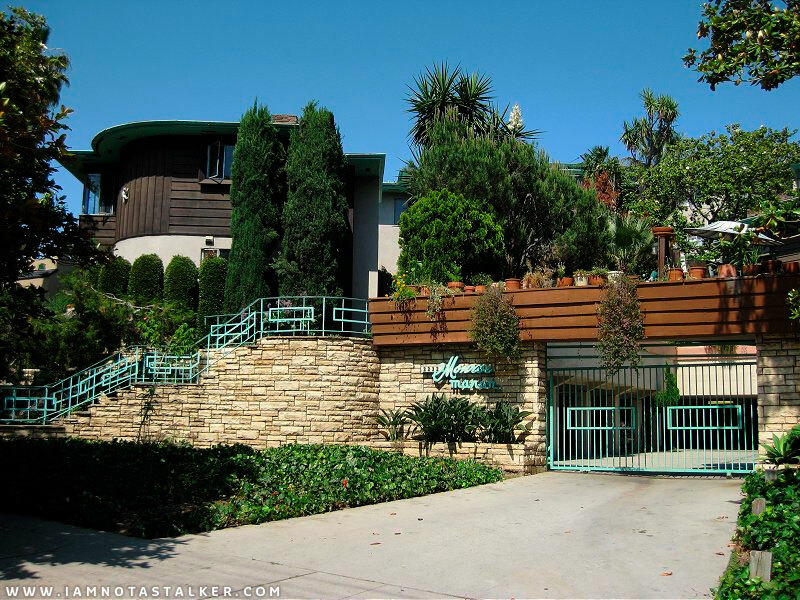 The Monroe Manor complex located at 2232 North Beachwood Canyon Drive in Hollywood. Always been intrigued by this car and until seeing the photo of the “before”, I had no idea how bad the wreck was! What an incredible amount of work and restyling. I’d love to see this parked side-by-side with the Golden Sahara and Parisienne…what an incredible collection of wild kustoms roaming the streets of LA at that time. Man that car was in bad shape when Gaylord got it. As was often the case by the third version it became a bit ridiculous for my tastes but it was a stunner in it’s first and second incarnations. It would be amazing to see this resurface.